The new joint venture will target charging systems for EVs ranging from airport trailers to electric bicycles—and also, cars. China is going to be the world’s biggest electric vehicle market someday, but that doesn’t mean that everyone in China is going to be plugging in their electric cars anytime soon. In fact, only about three in 100 Chinese citizens own a car at all. Instead, we may see EV charging infrastructure emerge first for other types of electric vehicles. One category might be the 120 million or so electric bicycles and scooters on China’s roads. Another might be the industrial service vehicles, like the trailers that tow jet planes from airport gate to runway, that can be conveniently charged on-site. Those are some of the markets that ECOtality is looking at serving with its new joint venture launched Wednesday with China’s Changchun Eco-Power Technology Co. The JV, to be called Tianjin Eco-Power Technology Co., will include a new assembly facility in the city of Tianjin, and the two partners plan to jointly invest $12.5 million into the project, ECOtality CEO Jonathan Read said in an interview. While Wednesday’s announcement was short on specifics on just when that factory might start churning out charging systems and in what volume, Read said it’s definitely targeting the Chinese market. China’s most recently adopted five-year industrial plan calls for about 400,000 EV chargers to be deployed in more than 20 pilot cities across the country by 2015. At the same time, it has backed off on some of its most ambitious plans to push EVs onto the country’s roads. That’s one of the reasons why Read sees ECOtality’s new Chinese partnership tackling other markets first. To be specific, “We’re going to be announcing airports first,” Read said. ECOtality already charges up electric airport trucks, tractors and other vehicles via its Minit-Charger business, which it acquired from Edison International for $3 million in 2007, and Read sees an open market in China. Other early markets include electric bus charging systems, which ECOtality is also working on in Shanghai, he said. Electric bicycles, which are usually charged by removing the battery and taking it inside to plug into a wall socket, could be another opportunity, he said. As for cars, Read said that Changchun Eco-Power Technology is working on parking garages that maximize space in congested city environments by stacking vehicles with conveyor belts and elevators. That could be a convenient place to put chargers for the few EVs that end up parking there. This isn’t the first foray into China for ECOtality. Back in 2009, the San Francisco-based company launched a $15 million joint venture with Chinese partner Shenzhen Goch, which in 2010 announced that it had set aside $300 million in credit from China Construction Bank to back the rollout of chargers. But that joint venture has since been terminated, after Shenzhen Goch decided to back out of the EV charging field, Read said. ECOtality did not take a financial hit in that process, because its Chinese partner had covered the costs of the JV, he said. Other companies working on EV charging in China include Palo Alto, Calif.-based startup Better Place, which opened one of its battery swapping stations in Guangzhou in December with China Southern Power Grid, and BYD, the Chinese electric carmaker, which is charging its electric taxis in Shenzhen and has proposed building a “charging tower” in Hong Kong to get its EVs into the city as well. ECOtality’s manufacturing partner and grid giant ABB could also play a role in its China plans, Read said, though he wouldn’t provide any specifics. 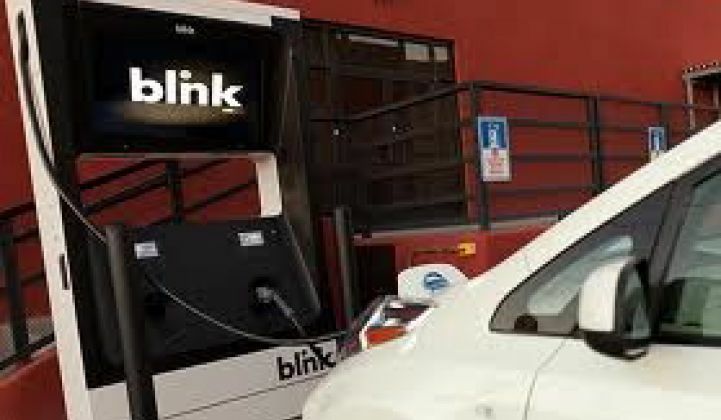 ABB is building ECOtality’s Blink operating platform into its own line of car-charging equipment. It’s quite likely that other grid giants in the car charging space, such as Siemens, Schneider Electric, General Electric and Eaton, will get involved in China as well.